F.B.I. Awards Glock New Duty Pistol Contract! You are here: Home / Firearms / F.B.I. Awards Glock New Duty Pistol Contract! The new F.B.I. Glock 17M (photo courtesy of our friends at TFB.com). The Federal Bureau of Investigation (FBI) has just awarded an $85 million contract to Glock for the procurement of thousands of new Glock 9mm handguns for duty use by FBI Agents. The new Glock pistols will be 9mm, rather than the current .40 caliber FBI Glocks, but will be modified slightly to meet the RFP restrictions. This announcement came much sooner than we expected, however with Glock being the FBI’s current pistol supplier, I can see how a decision could be made more quickly. The official Contract Award Number is: DJF-16-1200-V-0006459. Several months ago we posted an article titled “FBI Selects New Duty Pistol“, which discussed the FBI Request For Proposals on a new duty handgun. In the article we pointed out a series of design specifications that eliminated almost every major handgun available on the market at that time. That is, except for the Sig Sauer P320. The RFP appeared almost tailor-made for the newest striker-fired polymer framed pistol from Sig Sauer, which had gained considerable attention after release. Well, I was wrong! And I’m actually very excited I was wrong, because we’re getting a look at an all new Glock in short course. 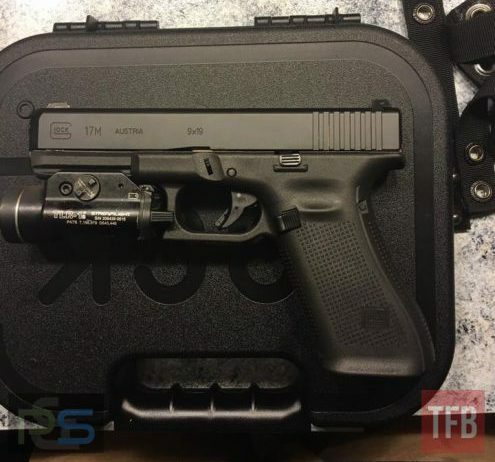 The new Glock 17M, with Streamlight TLR-1 tactical light attached (photo from our friends at TheFirearmBlog.com). FBI Selects an All New Glock! 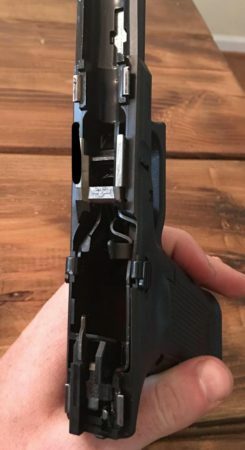 When the FBI RFP was released in October, 2015, Glock was only eliminated by the current finger grooves on their frames, missing a flared magwell, and not having magazines with stripper base plates. It appears Glock made the few minor adjustments and met the FBI’s demands. The new F.B.I. pistol has been designated the Glock 17M. However, this new Glock (designated 17M for now) is more than simply mix-matching Gen 1 or Gen 2 frames with Gen 4 slides and barrels. 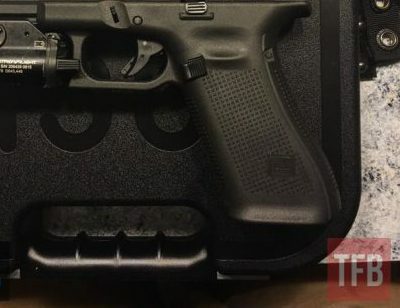 The flared magwell, and frame without grooves will be a whole new creation, sparking a large discussion on if the “new Glock” will become available to the public – and when! 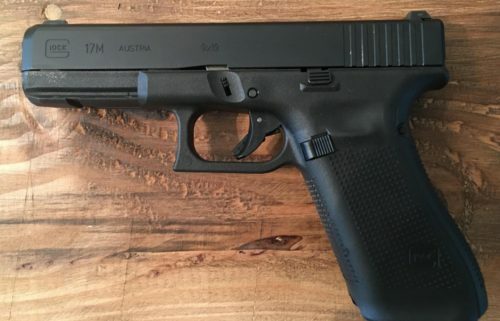 The new Glock has been rumored to be the new “Gen 5”, however, the photos and company are simply designating this new pistol the “G17M“. The selection of Glock really should not be surprising. Though I made an articulate argument that the RFP was tailored to select the Sig Sauer P320 (and I still feel it was suspiciously close) I also left open the reality that the major firearm manufacturers would not just sit down without trying to win such a large contract. In fact, I pointed out that Glock was one of the most viable possibilities, since they would only have a few minor adjustments to meet the criteria (including already having frames without finger-grooves). The flared magwell and straight grip quickly distinguish the 17M from its predecessors (photo courtesy of TFB.com). There are no finger grooves on the 17M, something many shooters had complained about (photo courtesy of TFB.com). The flared magwell with stripper magazine base plates will enhance the overall performance of the pistol immensely during the highly critical moments of magazine changes. The removal of the grip finger grooves will ensure that more Agents of all sizes are able to obtain a solid master grip. Though the current Gen 3/Gen 4 finger grooves fit my hand well, I fully realize this is not the case for everyone. Being issued a handgun that doesn’t exactly fit well can be a miserable experience. This move makes sense for the F.B.I. and Glock. Stronger slide lock lever spring. The upgraded recoil spring assembly could reduce overall felt recoil and muzzle rise by allowing more force to be expelled in the recoil spring. 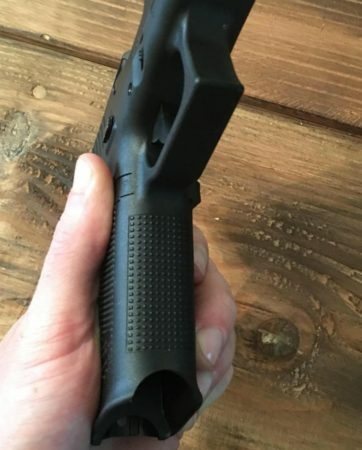 To accomplish this action, and further the benefits, Glock moved the recoil spring assembly notch further back on the barrel attachment. The most current, and I believe best 2-handed shooting stance, has sometimes caused shooter’s to inadvertently press the slide lock lever upward while shooting causing the slide to lock in the rearward position before the magazine was empty. 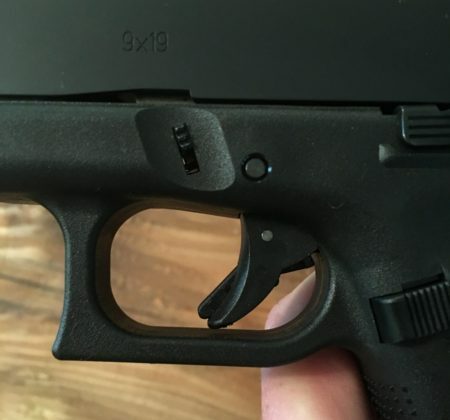 Even though the Glock slide lock lever has a very low profile, Glock has added a raised bar just below the slide lock lever to prevent this action during shooting. Now, a more deliberate action must be completed to raise the slide lock lever. The stronger trigger safety pin is a little surprising. Though Glock’s are not typically described as the smoothest actions in semi-auto pistols, they are very consistent. This is just one reason they are so popular in law enforcement and civilian markets. The stronger trigger safety pin appears to be an F.B.I. specific request. Though the trigger pull specified in the RFP was between 4.5 to 6.o pounds, this new pin may raise the standard Glock trigger pull of 5.0 to 5.5 pounds closer to the 6.0 pounds. Only time will tell if the stronger pin provides a smoother trigger pull, though I have found the Glock trigger to be fine in its original configuration. All together though, the new Glock 17M may appear very similar to previous Glocks, but it has the potential for operating much better. If the enhanced trigger safety spring makes take-up smoother that is huge. Enhanced rails, slide lock lever spring, and ejector should make a nearly flawless action even better. The removal of finger grooves makes the pistol much easier for all-sizes of shooters, while the flared magazine well and stripper-plated magazines should make reloads much faster. The Glock 22 in .40 S&W was the FBI’s main duty pistol for many years. The new FBI Glock will change appearance and caliber (photo by Glock). 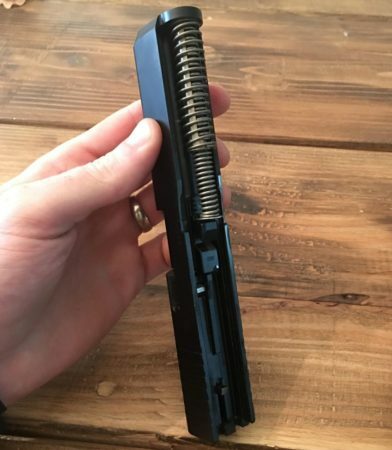 The recoil spring assembly notch has been moved about 1/4″ further back on the barrel attachment (photo by TFB.com). In addition, Glock has proven itself as a highly durable, accurate, and reliable pistol for 30 years in America. There really should be no surprise that Glock owns around 65% of the law enforcement market in the United States. Police officers need a reliable semi-auto handgun, capable of chambering the most widely used calibers (9mm, .40 S&W, .45 ACP), with reliable magazines capable of providing officers enough firepower to win a deadly force encounter. The trigger safety pin is more robust on the Glock 17M, perhaps requiring a stronger pull (photo by TFB.com). Glock not only delivers all of those needs, they have been extremely gracious to law enforcement agencies making the purchase of brand new Glocks very reasonable. 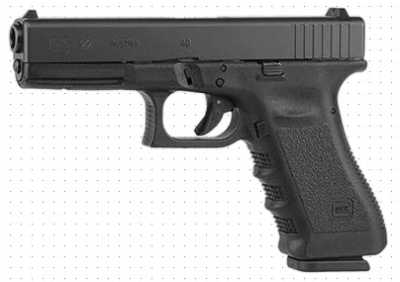 Typically Glock will offer a buy-back of the department’s current handgun, with a corresponding significant reduction in the price of a new Glock. It is not unheard of for police department’s to obtain new Glock handguns for as little as $350 (easily $200 less than market price). What the F.B.I. actually ends up paying should still be a savings over many competitors. The slide stop lever spring, rails, and ejector have all been strengthened (photo courtesy of TFB.com). Yet it is not just the price that has made Glock a winner. It is its performance time after time. Glock handguns have never won any beauty contests – they are painfully simplistic in their appearance. However, they have more than made up for a generic profile with a firing mechanism that is amazingly simple, and a trigger (with reset) that can make follow-up shots amazingly fast and accurate. Despite being half polymer, the Glock handguns take a beating and keep on shooting. The Melonite-type finish (previously Tennifer) on the slide is incredibly resistant to scratching, scuffing, rust, and corrosion. The polymer frames can get scuffed up, but for the most part maintain their integrity through harsh abuse, providing the stable platform necessary for accurate shooting. I’m very excited to hear Glock won the FBI contract. At a time where many have been attacking Glock for one reason or another, it is refreshing to see the company can still put together a winning handgun. Though there have been some legitimate issues with some of the Gen 4 Glocks (though highly exaggerated in my opinion), the new FBI Glock 17M appears to be another winner. The FBI is known for conducting some of the most rigorous and scientific studies on firearms and ammunition. If the FBI is satisfied with the new Glock, then this new handgun should have all our attention. To those who argued against my points in the original RFP article , I yield my pulpit! But I do so with a smile on my face, and an eager curiosity to put my hands on the FBI’s New Pistol – the Glock 17M! Though the RFP appeared suspicious, I’m confident the selection process was not. I wonder if the US Army will sit up and take notice. The Glock 19 recently won the NSW contract and is very popular in the SF/ODA circles. As tough as those units are I wager that the FBI will use its pistols a thousand times more than any unit in the US Army. Additionally the Army Chief of Staff basically said he would prefer buy a pistol from Cabela’s to simplify the ridiculous military weapon’s contract rules, this seems like it would provide easy political cover to just “get it done”. If the Army ever got it’s act together buying the same pistol as the FBI would make it a bit easier for Uncle Sam to just buy a ton of dirt cheap Glock parts. I think your observations are spot on Seamus, and the Army Chief of Staff said the same to Congress. Unlike rifles and heavier squad weapons (that have a much greater impact on battlefield outcomes), the soldier’s pistol highlights the handgun’s true purpose – self-defense, and not a weapon of offense like the long guns. In that regard, the only real “qualifications” of the pistol are durability, dependability, and the preferred caliber. Glock has proven all of those. It doesn’t require a huge expenditure for testing and evaluation, which unfortunately is where the politics have entered! You would be surprised how little the Bureau uses it’s handguns. I could name several Army Units that shoot many , many more times than the Bureau.. Check your opinions carefully. Very true on shot placement, and very likely on female or smaller stature Agents. However, true “stopping power” is a combination of shot placement and damage done. In that regard the .40 S&W expands more, has more energy, and a greater potential for damage. Then again, if you’re not hitting your target then damage doesn’t come into play. It really is a difficult balance between enough bullet, and enough accuracy. In most situations I believe the FBI will be fine, but in one area law enforcement is frequently confronted with (intermediate barriers – windows, car glass, plywood, sheetrock, etc.) the .40 S&W consistently outperforms 9mm. While the choice was entirely predictable, I was hoping for a change for the better. It was never going to be anything but Glock. That said, the new Glock…well, I think folks will be impressed. I am not a Glock fanboy by any stretch of the imagination. But this one impresses even me. Glock finally put their pride in their pocket and listened. Having a “new” Glock will make transition training much easier and quicker. I’m excited to see the “new” Glock, and what it could mean for the civilian market as well – not just for Glock, but for all the majors. The Glock 9mm handguns will essentially give Agents more firepower with less weight. Agents in Rural areas of the United States, as well as on Indian Reservations, will have a handgun and enough firepower to defend themselves. The smaller bullet will allow them to shoot more accurately at longer ranges while suffering from less recoil. The 9mm and the .40 Caliber both have its benefits…..but overall the 9mm will hurt the Bureau less on their budget for training and qualification, because ammo is cheaper. 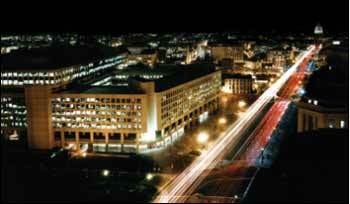 The FBI sets the standard in Law Enforcement in the United States, from overt Law Enforcement….to undercover work. Law Enforcement Agencies nationwide changed to the .40 Caliber after the Bureau did……now they will probably go back to the 9mm ! The new Glock 9mm handguns will give the Agents 2 more shots per magazine, and 9mm is cheaper. However, the capacity to create injury (greater expansion and energy to do it) is realized better with the .40 S&W. I believe you’re right about some move back to 9mm, but the .40 S&W has been entrenched in law enforcement for a couple of decades. Police agencies/officers are used to the round, and it outperforms 9mm through intermediate barriers, so I don’t see a mass exit happening. Though the FBI does incredibly good work on an investigative side, they are not really an overt law enforcement agency. For a good standard in that arena I’d look towards a few of the State Police agencies, and some really good city/county police agencies. Grip angle is the only thing left that needs improving. Glock needs to offer the John Browning grip angle and the pistol will be nearly perfect. I would love to shoot a Glock with the Browning grip.